My very favorite thing to make in the kitchen is something baked, sweet and easy. I don’t like to spend a lot of time, but I want something that looks like I did. Quick breads are the perfect answer to all those things. Most of the quick bread recipes on my blog are very simple and call for ingredients you already have in your pantry. Once in a while I’ll challenge myself and make something a little more involved but not very often! I seem to be getting a lot of the same questions when I post a bread recipe so I thought I would address them all at once. 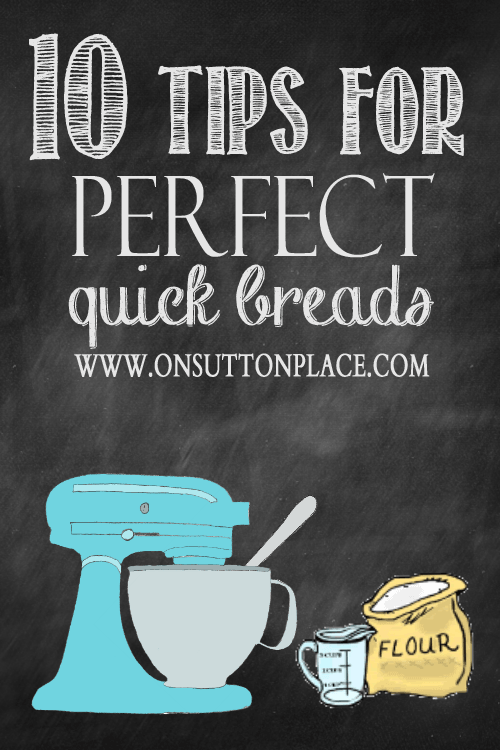 I came up with 10 tips for perfect quick breads so lets get started. Some links lead to shops or websites where I am affiliate. Click HERE for my complete disclosure. A few years ago I discovered a line of bakeware available at Williams-Sonoma. It’s called Goldtouch and these pans really do, in my opinion, make a difference. The first thing I bought were the cookie sheets and I fell in love after using them one time. Since then I have added several more pieces. I ask for them for Christmas because they are a bit pricey. The mini loaf pan is my favorite but I also have the individual mini loaf pans. Every single loaf comes out baked evenly and moist. 2.) Prepare your pans well. Several years ago I discovered a product called Baker’s Joy. I don’t know how long it’s been around but it’s what I use to prepare my baking pans. You can get it at the grocery store right next to the Pam. It also works really well to lightly coat your pan with Crisco and then dust it with flour. The Baker’s Joy is easier and saves time. 3.) Oven Placement: Bake at the top. I have cooked in only three different ovens in the past 32 years. In all of my ovens, baked items always came out better if I put a rack near the top of the oven. I know all ovens aren’t the same so try out different placements. The top of the oven is what has worked for me. 4.) Mix the dry ingredients first. Some recipes tell you to do this and some don’t. I always do it because I think it makes sense and is easier too. I have a clear pyrex bowl, I measure everything out and then use a whisk to gently mix it all together. 5.) Always add the dry ingredients to the wet ingredients. The other way around just doesn’t work…ever! What I do is mix all the wet ingredients (butter, eggs, vanilla, sour cream, etc.) along with the sugar in the bowl of my standing mixer. When it’s well mixed I then add the dry ingredients. Nuts or any other type of addition can be folded in at the end. 6.) Glaze: how to avoid a mess! Many times quick bread recipes call for some sort of glaze to be poured over the loaves after baking. I’m not going to lie…I have made such messes trying to do this! The easiest way to avoid a mess is to place a cooling rack on a large piece of foil. Place your loaves on the rack and then pour the glaze over them. Any glaze that runs off will fall on the foil. The only clean up is to toss the foil in the trash! 7.) Baking Soda or Baking Powder? Personally, I like to use both. I have found that recipes that call for both usually bake more evenly and are fluffier. When recipes are written, usually the leavening agent is chosen based on the acid present in the ingredients. I don’t really understand the chemical part of it…all I know is that when I use both baking soda and baking powder, I get a better result. Of course, if you are a stickler for following a recipe exactly, you might want to skip over this tip! 8.) Salted butter or unsalted butter? This one may be a shocker, but I always use salted butter when I bake. Depending on the recipe, I then cut back on the salt measurement. If a recipe calls for only 1/4 t. salt I just leave it out completely. It’s a personal choice. I like the taste of salted butter better. If you’ve never baked with salted butter, you should try it. It’s really very good! 9.) Wrap your bread while it’s still warm. This little tip came from my friend, Connie. 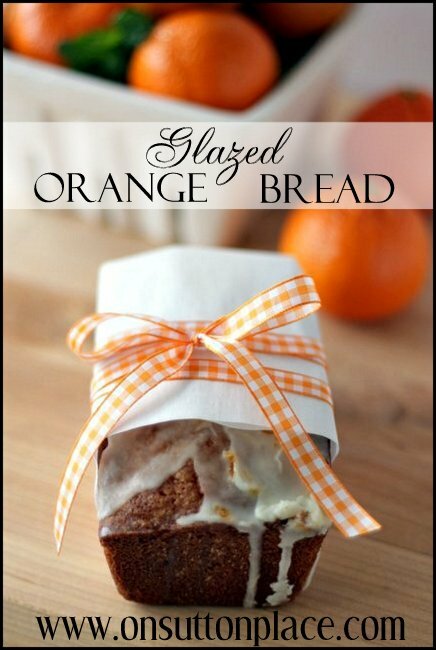 The first time I tried it was with my Pumpkin Bread. Oh my gosh. What a difference it made! After I take my loaves out of the pans, I let them cool for a bit on racks. Before they are completely cool, I wrap them in Press’n Seal. If I am freezing any, I put the wrapped loaves in a ziploc freezer bag and they are good for months. Of course, if you have a glaze to add this won’t work. But if not, I highly recommend it. 10.) Dry roast the nuts. This only takes a few minutes and it makes such a difference. If your recipe calls for walnuts, almonds or pecans, sprinkle them on a cookie sheet and bake in a 350 degree oven for 8 – 10 minutes. About halfway through, shake the pan to move them around. If you start to smell them that means they are done. Roasting the nuts brings out the flavor and makes them so incredibly tasty that it’s worth the extra effort! I have started putting the pan measurements and separate baking times on my bread recipes. I am in the process of adding it to all the older recipes too. 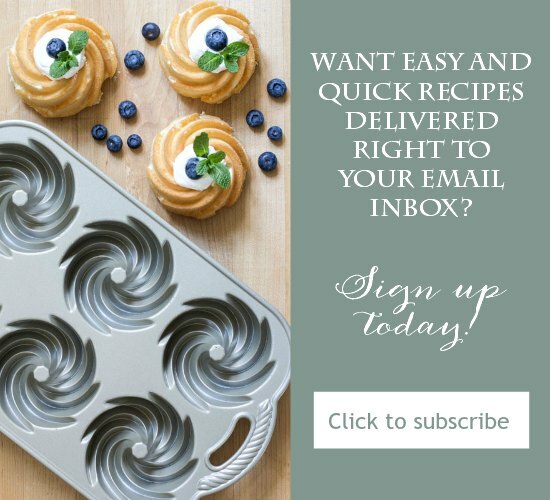 Now that you have these tips in your arsenal, stop by your kitchen and bake something amazing! Shop for my favorite Goldtouch pans! Thank you for these wonderful tips! I’m going to incorporate all of them into my sweet bread making :) Do you have any tips for adjusting the baking temp or time when using mini loaf pans? I used the toothpick method last time I made banana bread. The toothpick came out clean, but after I pulled my bread out of the oven, the middle sank because it wasn’t done. Thanks so much! I pinned this when you first posted it and now I”m back reading your great tips because I have several loaves to make for a work breakfast this week. Thanks so much for the recipe links as well. The glaze on cooling rack and foil tip is awesome and is going to save me from a big mess tonight. I’m going to wrap them still warm, too. Thanks again. Fantastic site!! 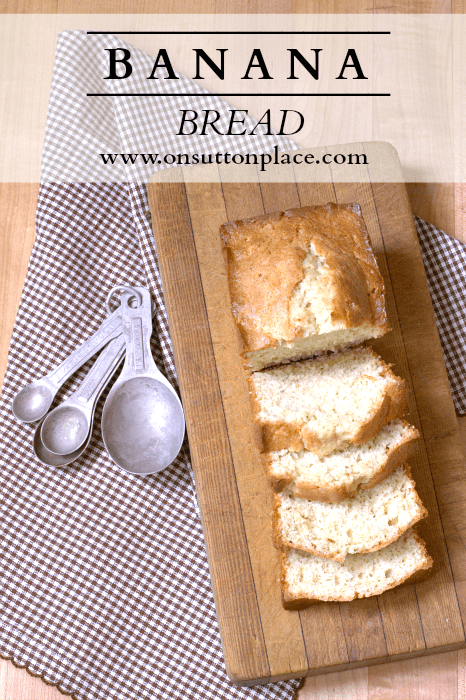 I was reading all about plants, since it’s been a terrible winter here, and we have a new house to finish planting and I’m I’M READY~~~when I saw that you had wonderful quick bread recipes. I wonder if you ever have the “mushy top” problem!?!? I’m the quick bread queen in the family, love making them and sharing them, but HATE the mushy top that happens. I test to make very sure they’re done, but I can leave them out to cool & then wrap, I can wrap when still warm & freeze–it doesn’t seem to make any difference, on the second day, they have a gooey top. WHAT in the world am I doing wrong!?!?!?! I don’t use the press & seal wrap, only foil, but but I think that would just add to my problem. And like I said, it doesn’t matter if we’re eating a loaf that has been frozen or one that’s fresh. Am I going to have to always keep my loaves in the fridge?? Thanks for any advice you might have!! Hi! Thanks for the great post! I was wondering if you have any tips for baking with chocolate chips? 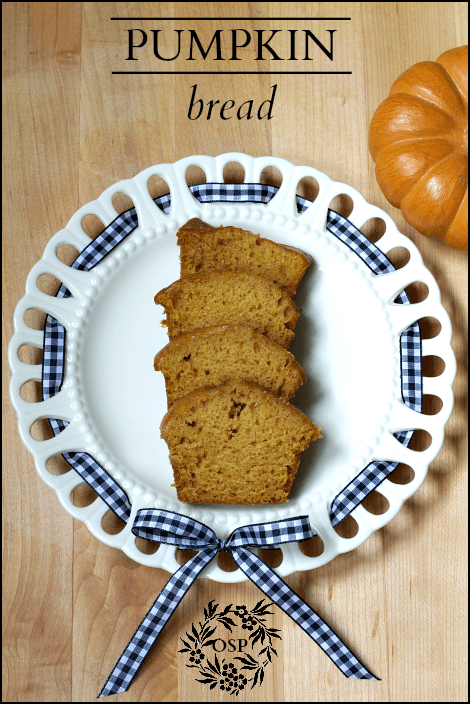 I like to throw them in my pumpkin bread, but they always sink to the bottom, and usually get stuck to the pan! Any suggestions would be great. Hi Megan…I’m so sorry for the delay in answering your question. I somehow missed this one! Why don’t you try just sprinkling the chocolate chips on top of the bread and swirling them in with a knife…that way they will be more towards the top of the bread. If they sink, they might not sink clear to the bottom. Hope this helps! try coating the chocolate chips in a little bit of flour shake off the excess then mix in or sprinkle on the top. Same goes for fruit or berries. If the fruit is frozen, thaw and pat dry with a paper towel then coat in flour. This helps the chips or fruit from sinking down! I have a really big question about Tip #5 – seriously? 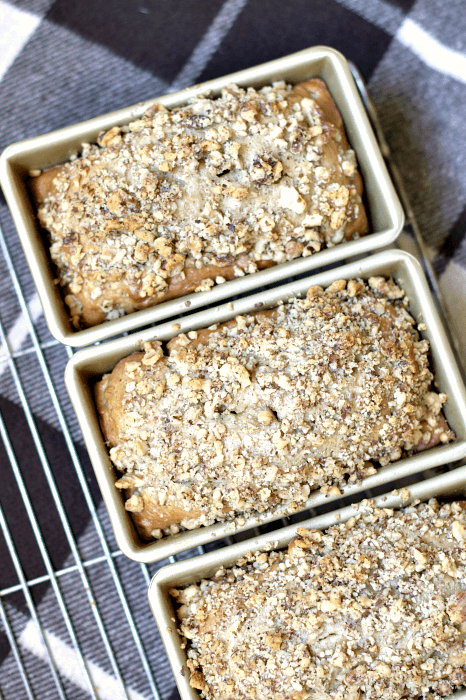 I had MASSIVE problems with getting major clumps of flour in my quick breads until I started doing EXACTLY the opposite – I have to add my wet to my dry. That’s the only way I don’t get clumps. Any ideas why it works for you, but I’m completely different? I went through a phase where I was making a loaf of Amish friendship bread every few days. Those were glorious days, but then I got tired of keeping all those bags of starter around and trying to figure out who to give it to. I am drooling over all your amazing recipes; I’ve clicked over to several. And I plan to check my pantry and make a loaf RIGHT THIS MINUTE if I can muster all the ingredients. Yes, I should be working or crafting or blogging, but I’d rather be baking! Hope you got a chance to bake some bread…thanks for stopping by! Thanks Ann for all the quick bread recipes and tips. 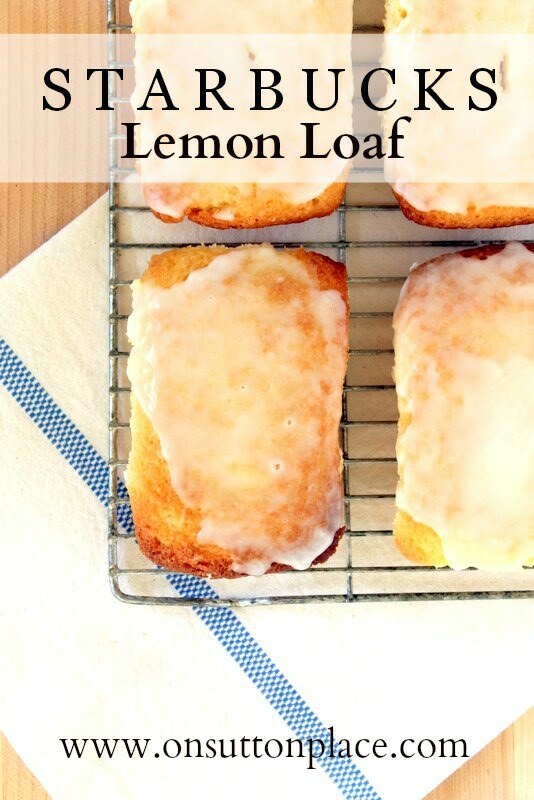 I have a bag of Mayer lemons on the counter now so the Starbucks Lemon Loaves will be the first recipe to make. Love checking my inbox and seeing a new post from you. over the holidays i found a renewed love for baking breads. there’s nothing like the smell of fresh baked bread coming from the oven. thanks for these great tips + tantilizing recipes! can’t wait to try. Ann, I am going to try some of your breads they all look good. I wanted to ask you about your felting projects I know you said wool. I have an old cashmere sweater will that work? Love your blog. 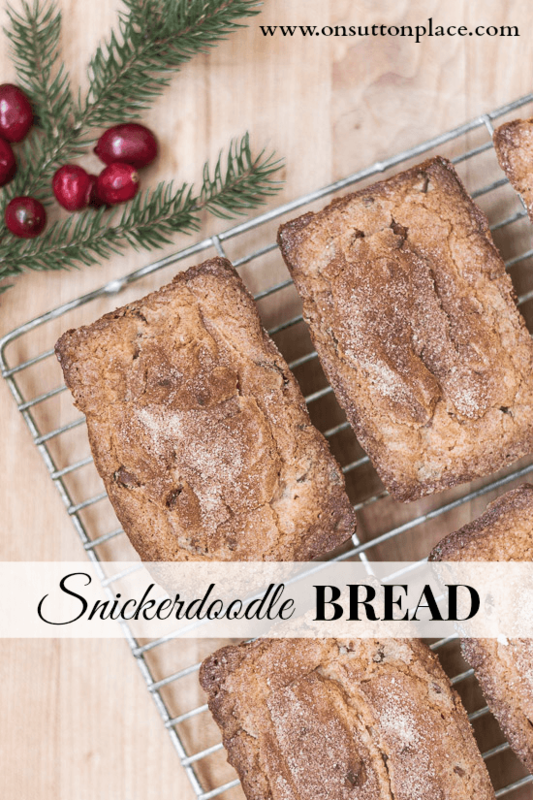 I made your Snickerdoodle bread at Christmas. My grandson L❤️VED it. I made it on Saturday night, went to work on Sunday and when I returned home it was gone! Love that growing teenager. I thought of you today! I was in Anthropologie and I saw these cute bake and take quick bread bakers and bags for sharing. I love the goldtouch line, too. I use their cookie sheets. These tips are all so helpful, and I’ll try the salted butter because I always use sweet butter. Really appreciate these tips, Ann, because I bake gluten free quick breads for my breakfast once or twice a week. I’m especially eager to try wrapping the breads while still warm. (And I’ve always wondered about recipes that call only for baking soda or powder.) Thanks! I have about a cup of pumpkin left from a recipe for Pumpkin Roll with cream cheese filling (delicious!!). I don’t know what to do with it. I thought I could make some cookies but many recipes require more than a cup. I saw your recipe here and thought, hmm, I could make pumpkin bread until I saw it called for 15 oz. I think I might have to just throw it out which I really hate to do. Thanks Ann, for some delicious recipes! Why don’t you try cutting the pumpkin bread recipe in half? That might work and you won’t have to throw away your pumpkin! Ann, thank you so much for sharing all these quick bread recipes. I have pinned them and I certainly will make them. My husband and I really like breads like this with a cup of coffee. Have you ever made strawberry bread? 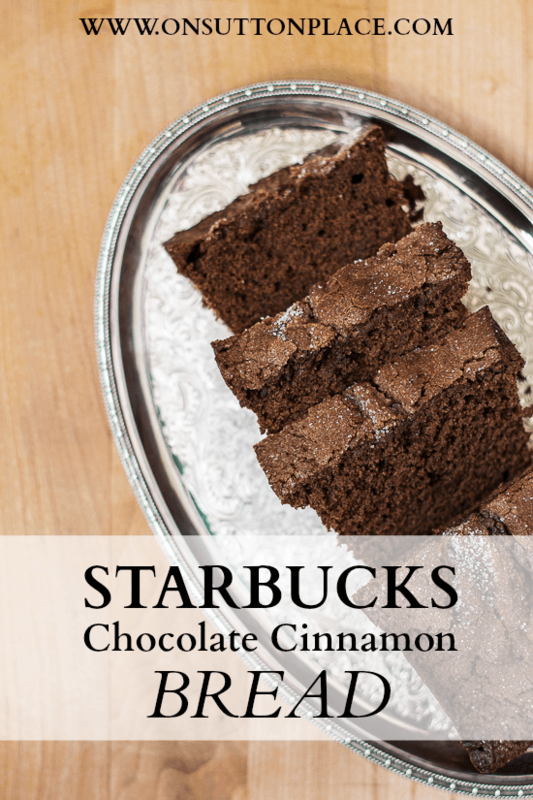 I have a great recipe that is so moist if you don’t have one. Thanks Jeanette! I have made a strawberry coffee cake but not bread. I would love to try your recipe. Could you email it? adrake606@aol.com. Wow! 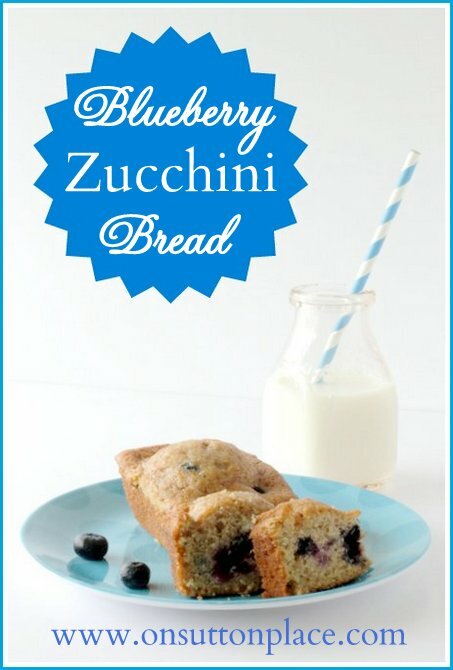 I love to bake and your post just made my life so much more fun..Great ideas. I’ve said this before. I love your blog. 2014 is going to be so exciting in the blogging world. Love this post! Great baking tips. I have cooked with both gas and electric ovens. I find the electric oven is superior for baking. Gas ovens tend to cook unevenly because of where the heating element is located. My favorite oven is the electric convection, cuts down cooking time by 1/3. They are a bit pricey though! I will be honest, I HATE to bake. That said, I love sweets and when I do my shopping tomorrow morning I am going to make it my mission to try at least one of these. My nephew is getting married in May. His fiancée has those WS gold pans on her registry. Maybe I will print this out and give it to her along with the pans. Thanks for the most informative post! What a great idea for your nephew’s fiancee! Honestly, these recipes are all very easy and quick. Just try one and you may be hooked! I agree with you on the pans…..5 star and should be on every bridal registery. These pans will last a lifetime and never want another pan. I think they just are well known, what a shame. Thank you for adding the pan size and baking times to your recipes. When I see someone post a recipe and say ‘small loaf pan’ it isn’t helpful I just pass them up. And another way to toast any nut is on stovetop and watch closely. That way we can use them to sprinkle on salads anytime. Maybe you can have a discussion on the different flours on the market. Flour types, sift or not sifting. Also with a new recipe that doesn’t use both baking powder and baking soda how do you adjust to use both products? Hi Dee! I’ve seen nuts toasted on the stovetop on TV but never tried it myself. I will soon. I wouldn’t be a very good person to write about flour. I use all purpose flour for everything and I never sift it! I have tried whole wheat flour but really don’t care for it. If I have a recipe that calls for either baking soda or baking powder, I usually add 1/2 t. of whatever was left out. I know some recipes probably shouldn’t be messed with but I usually do it anyway! What a terrific post, Ann. I have made several of your quick bread recipes and they are all just yummy. I have a question about suggestion #7. What do you do if a recipe calls for only baking soda or baking powder? Do you use half of one and half of the other? I am not clear on this. If a recipe calls for one or the other, not both, I usually add 1/2 t. of whatever was left out. Occasionally I make a recipe that calls for a large amount of leavening. If that is the case I usually leave things alone! By large amount I mean more that 1 or 2 teaspoons. Do you have an electric or gas oven? Do you think it makes a difference? Hi Melody! All my ovens have been electric so I have never used a gas one. I really don’t think it should make a difference if your temperature is correct. Sorry I’m not much help on this one! perfect post Ann! I always toast my nuts. I just put them in when I turn the oven on to preheat and set the timer for 7 minutes. If they aren’t quite ready when the timer goes off I just shake and roast for 2 more minutes. 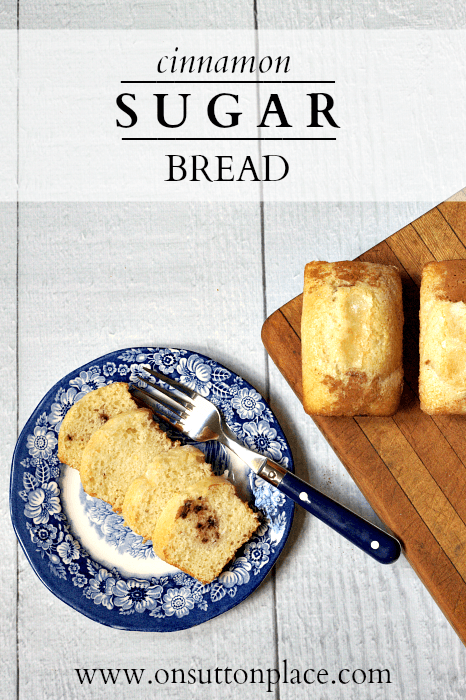 I’m off to make some snickerdoodle bread – my husbands favorite cookie. This is a brilliant post, Ann, and I shared it on blogtalk because I think it’s so amazing! I’m also pinning and sharing. Great job, my friend! Great tips, Ann. And of course, I’m now pinning some of your breads that I’ve missed. I didn’t know the “wrap while warm” tip. I’ll give that a try! I have never heard of storing the bread while still warm. Thanks for that tip, I will try it next time.